Whitney Thomas recently transitioned to a full-time position in NGU's Outdoor Leadership department. Whitney Thomas has joined North Greenville University's Department of Outdoor Leadership as a field instructor, equipment manager and also adjunct instructor. We sat down with her this week for a Q&A about things students want to know about her and the department. What got you interested in outdoor activities? One of the first times I encountered the Holy Spirit was as a Sophomore at NGU. I was walking back from Tuttle Clinic when I spotted multiple tents on the grassy field. I asked the “tent-guard” why the tents were there. He responded by telling me about a brand new major called outdoor leadership. I suddenly felt this strong drive to switch my major that very day and not tell my parents until after the deed was done. So I walked immediately to the office and changed majors. I had been camping as a kid, but honestly had no idea what I was getting into. What outdoor adventures have you been on? I’ve backpacked, rafted, canoed, sea kayaked, caved, biked, kayaked, and climbed. One of my most favorite trips was a month long canoe expedition from Canada to Lake Superior. The trip ended by traveling the Grand Portage, an eight and a half mile trek on land carrying canoes and gear to reach Lake Superior. If I had to pick a favorite it would be rafting. I come to love the river more and more every year. Why did you come to North Greenville? 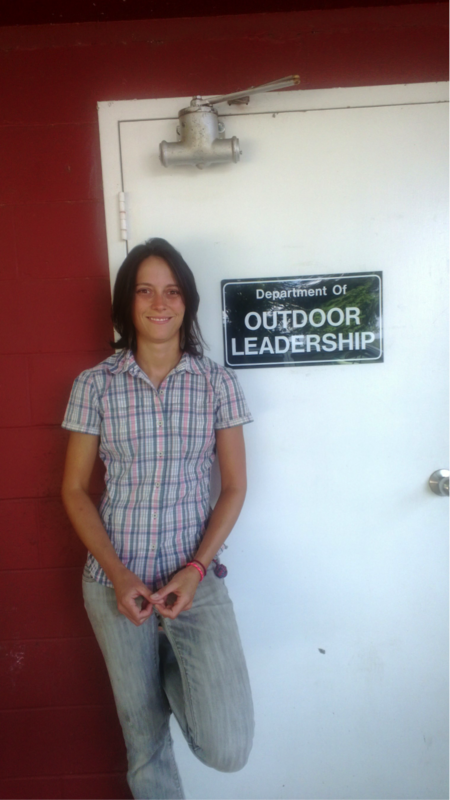 I graduated from the Department of Outdoor Leadership in December of 2006. I fully believe in the Department’s purpose to create an authentic community that desires to educate, equip, and empower future outdoor leaders. I have a strong desire to see students, and myself, grow spiritually through challenge, community, experiential education, and fun. What is your favorite thing about NGU? My favorite thing about NGU is the students. I’m always learning something new through talking and sharing life with them. Would you consider yourself a hard teacher? If so, why? Overall, I desire students to succeed. My goal as a teacher is to provide all the necessary resources and skills to do so. Some students have said I’m a very hard teacher while others have said my classes are average. I think the defining line rests with the investment level of the student. You definitely can’t just float through my classes expecting some magical grace – there’s a good bit of personal investment involved. What does the Department of Outdoor Leadership mean to you? As a former student, I have a deep love for the Department of Outdoor Leadership. I’ve seen a lot of growth within myself through the challenges present in teaching and learning in the outdoors. There’s a flag that hangs in my office from when I was a student. We created the flag as a picture journal of our first backpacking trip. Every time I really begin to look at it, I’m reminded of the value of community and challenge. I’ve lived in Greenville off and on for the past twelve years. During the summer, I’m a whitewater rafting guide in Colorado, but my original home is Charleston, SC. I live by myself in the middle of the woods in a house I’ve affectionately called the Hobbit House due to its short stature. The house gets water from a spring up the hill, has no heat besides a wood stove, and usually has at least one broken appliance. I still love the house though and spend most of my evenings reading books, cooking good food, listening to music, or visiting friends around the Greenville area. Wow- that’s a difficult question to answer in a short space. To be honest, I treated church just like school while growing up. I memorized answers to all typical theological questions. I jumped through hoops of tradition with surprising agility. I sanctioned part of myself to be devoted to operating as a “good” Christian girl. And I had no relationship with God. I could justify my actions and act the part in Christian circles like the most groomed and poised of actresses. It was a hollow existence and I didn’t care at the time to ask myself why I believed Jesus was important or even if my actions lined up with my words. This began to change slowly through the challenging questions and actions of the peers around me. I don’t think I knew who I actually was until towards the end of college. Along with this self-discovery came the realization that I was a person who acted to please others – especially the church. I spent several years after I graduated slowly relearning the things I had always thought I believed. The person of Jesus became important through this transition. He represents the embodiment of love which supersedes the law, not because the law is flawed, but because it’s irrelevant when you finally get the big picture. Just like Micah 6:6-8, those outrageous actions that make us think we’re doing things right aren’t necessary- instead it’s seeking justice, loving mercy, and walking humbly. I wanted the deeper meaning behind tradition and I wanted to know I was loved. I think that’s the hardest part of knowing Jesus to me- believing that I’m loved. If I truly believed that all the time, I would be free to love others well in return. Thomas began working for North Greenville in January of 2008 as a part time staff member for the department, but left in December of 2010 to pursue a master’s degree in experiential education. In the fall of 2012, she returned to assist with the immersion semester. Then, in the spring of 2014, Thomas taught as an adjunct professor for the department. This fall, she has taken a full time staff position and adjunct faculty position.